Two aging athletes and friends who fought on opposing sides in Bosnian civil war meet after quarter of century for one last climb. 21 November 2018, 13:00 to 14:30 at The Exchange, Kings College Strand Campus. For further info and to register. Panel discussion with artist, Dr Nela Milic (University of the Arts London) and political scientists, Dr Denisa Kostovicova, Dr Ivor Sokolic and Tom Paskhalis of the London School of Economics and Political Science (LSE). Thursday 15 November 2018, 6.30-8.pm, The Exchange, Kings College Strand Campus. For further info and to register. Artist in Residence, Dr Milena Michalski, In Conversation with artists on the theme of reconciliation and art at The Exchange, Kings College Strand Campus, 18.30-20.00pm. In connection with the ‘Reconciliations’ exhibitions, and bringing together some of the artists showing there with other artists whose work deals with reconciliation in the broadest sense, this public discussion reflects on a wide range of reconciliations – or not – including between art and atrocity, both past and present; the artist’s internal conflict during the making of work; between art and politics, art and psychology and between elements such as abstraction and documentation. For further info and to register. Artist Vladimir Miladinović will discuss his work from the project Rendered History, which deals with wartime and post-war trauma of the former Yugoslav societies. In addition Dr Paul Lowe will present his paper: Traces of Traces: Time, space, objects and the forensic turn in photography. 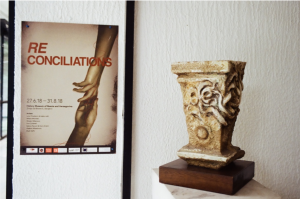 Art & Reconciliation: Final Exhibition and Symposium – Save the date! To mark the end of Art & Reconciliation: Culture, Conflict and Community, between from 1 November – 1 December 2018 we will be showcasing the artwork commissioned by the project in the Exchange Space at King’s College London. Alongside this, from 29 November – 1 December we will be holding a symposium where project participants, artists, practitioners and academics will explore the key themes of the project: What is reconciliation? What practices constitute spaces of reconciliation? What do the arts have to offer in post-conflict settings? How are we to measure the effectiveness of reconciliation interventions? To capture the eclectic and interdisciplinary nature of the project, the presentations will take on a variety of forms, from arts practice and contact improvisation workshops, keynotes, panels, exhibition walk throughs, and film screenings. Author k1507331Posted on 26th September 2018 Categories UncategorisedLeave a comment on Art & Reconciliation: Final Exhibition and Symposium – Save the date! Isabella Pearce (MA Student in the Department of War Studies, King’s College London), reflects on the exhibition, REconciliations, and artist workshops convened by the Art&Reconciliation project. The blog post can be found here. Reconciliation is proving to be a problematic concept for both practitioners and academics: it is laden with normative expectations and is often rejected by local publics. This policy brief (Reconciliation as Activity Policy Brief), based on a workshop with NGOs in Pristina, addressed this problem by reframing reconciliation as activity. It recommends further investment in English language teaching to improve communication between groups; a greater focus on younger generations; and, an appreciation of the importance of the informal domain in reconciliation. 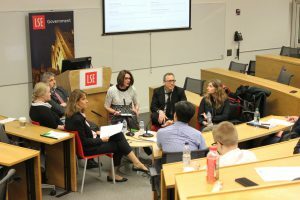 Hosted by the Department of Government at LSE, on 3 May 2018 leading scholars on the Western Balkans met at LSE to discuss the prospects for justice and reconciliation for the region, contested meanings of reconciliation and how the processes of reconciliation can be measured and evaluated. An event podcast can be found here. Participants included: James Gow (KCL); Denisa Kostovicova (LSE); Jelena Petrović (KCL); Jasna Dragović-Soso (Goldsmiths); Eric Gordy (UCL) and Jelena Subotić (Georgia State University). I was delighted to be invited to show in the exhibition ReConciliation , curated by Dr Paul Lowe and Elma Hasimbegovic as part of the AHRC Art & Reconciliation project. 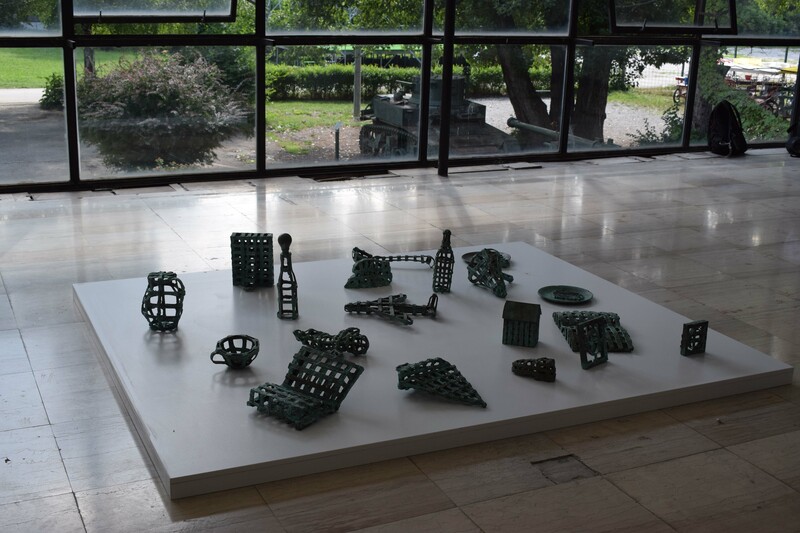 The exhibition ReConciliation provided me with a unique opportunity to show work that I made twenty years ago, before ever visiting Sarajevo, alongside new work made as a resulting of visiting in January 2018 and conducting research within the History Museum. 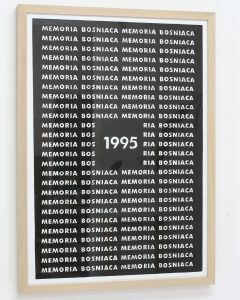 The earlier work had been made in response to Martin Bell’s BBC radio broadcast of April 1996 in which he signed off as BBC War Correspondent and reflected on the tragedy of the Bosnia war. I made two pieces of work; the first an artist’s book With the Melting of the Snows in which, through three visual chapters of computer manipulated photographs, I attempted to imagine the Siege of Sarajevo and make visual equivalents to Bell’s text. The second piece was a large installation of bronze objects Abandoned Landscape in which I tried to suggest objects left behind in flight, as if suddenly discarded. Whilst twenty years ago it was Bell’s broadcast that got through my defences and impelled me to respond, the new work I have made takes its key from research in Sarajevo in January as part of the Art & Reconciliation project. I was immediately drawn to a sweater belonging to Nermin Divović a seven-year-old child who was tragically shot by a sniper 100yards from the museum. His sweater, donated by his family is displayed alongside some photographs of him playing wearing the same sweater, as part of an exhibition remembering the siege. I have attempted to memorialise this short life, by commissioning seven duplicate sweaters, one for each year of his life, the first a tiny sweater for 0-1-year-old, through to one to fit a 6-7-year-old. I was really grateful to Anne Jones, a friend and curator at the Arts Council who helped me find a knitter. The sweaters were eventually hand knitted for me by Carol McDavid, a lady living in rural Wales (UK) to whom I sent drawings and photographs for her to work from. 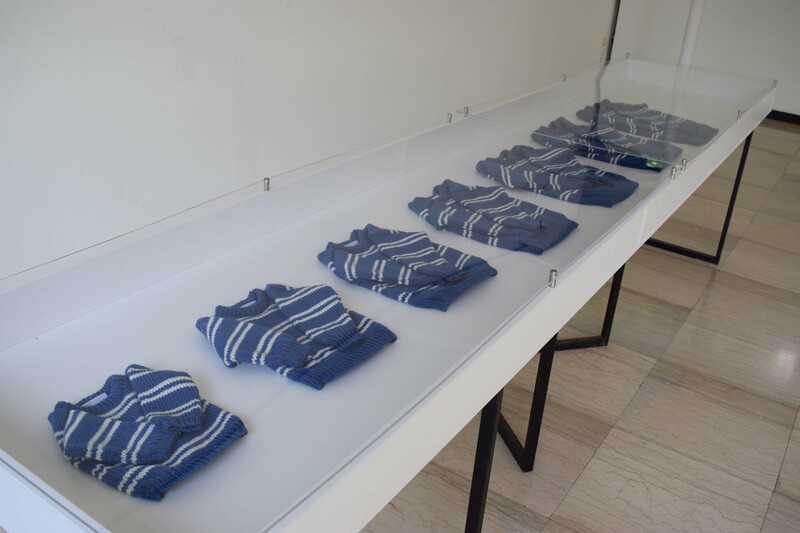 The sweaters entitled A Life Measured: Seven Sweaters for Nermin Divović are presented in a line as if recording a life which has been cut short. Another piece, Three Bottle for Sarajevo (for Edin Numankadic) takes its origins from the importance of plastic water containers to collect water in the siege and references a joke told to me by the artist Edin Numankadic’s that a man was crossing Sniper’s Alley with plastic bottles to collect water when a sniper shot his bottles, so the water poured out. The man screamed at the sniper, ‘don’t shoot the bottles, shoot me!’ Here in the black recesses of humour, lies a sad truth that without water you would be dead anyway. For me it is very poignant to show all these works in the context of Sarajevo and the Museum and its collection. My piece A Life Measured: Seven Sweaters for Nermin Divović is shown alongside the original sweater and sets up a dialogue between the authentic object and the imaginative space in which art functions. Furthermore, a hundred yards from the museum is a memorial stone commerating Nermin’s death so in this context I hope that my memorial of woollen sweaters suggests another way of remembering. In my case it is remembering through the actions of knitting with their associations with love, warmth and nurture. In terms of reconciliation, I believe that art has a powerful role to play in presenting images onto which ideas and feeling can be attached. Art is vital in supporting empathy, the capacity to see another’s point of view and without empathy, I believe reconciliation is probably impossible. Art provides a portal through which to view the world and as an overall exhibition I think it certainly offers that to the viewer. Reconciliation is a process and my hope is that in some small way, my work and that of my fellow contributors will provide means to help think about the immediate past and make a small contribution as to how we might imagine the future.